Security Policy Tool is an access control policy testing and verification solution. It has been developed with contribution from the National Institute of Standards & Technology to help organizations prevent access control leaks due to presence of hidden policy errors. Most companies do not have a comprehensive method for testing their policies leaving open the possibility of errors being left unfound and later leading to data leaks. Not only does it provide systematic access control policy testing, modeling, and verification features, Security Policy Tool also provides a powerful XACML Editor to make creating and editing your XACML access control policies more efficient than ever before. What is the best way to learn about Security Policy Tool’s features? We have many resources available for you to make learning about Security Policy Tool and the XACML Editor very easy. Check out the “Resources” tab near the top of the website where you will find the User Manual, Publications on Access Control Policy Testing/Verification, Tutorial Videos, and various News Articles. Be sure to check out the Product Page to get a good overview of the various features included in the solution. Still not finding what you are looking for? Email us at info@securitypolicytool.com or call us during regular business hours M-F, 9AM-6PM EST. How do I download a free version of Security Policy Tool? 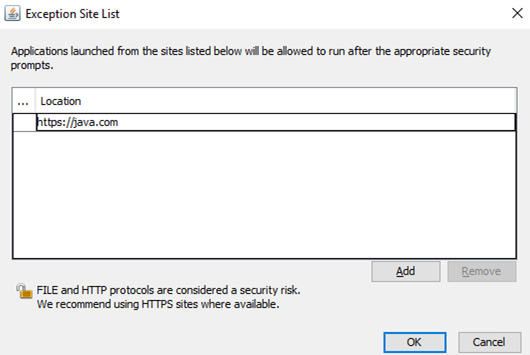 Click the green button located in the top right corner of the Security Policy Tool website titled “Lite Version”. You will be redirected to a new page where you will need to fill out the sign-up form and click submit. You will then receive two emails from info@seucritypolicytool.com. The first message to verify the email you entered during sign-up and a second message providing you the Security Policy Tool download link. After running the Installation Wizard you will be prompted to enter in the Username and Password you created during the sign-up process. NOTE: You must be connected to the internet the first time you activate Security Policy Tool. Sometimes your email provider may incorrectly interpret our emails. Please check your Spam or Junk folder for any emails from info@securitypolicytool.com. If you still are not seeing our messages you may have entered a different or incorrect email during the sign-up process. If so, you may need to sign-up again with an alternative valid email. The XACML Editor is included within the Security Policy Tool download. When you open and activate Security Policy Tool you can specify at the welcome screen whether you would like to open the XACML Editor or open Security Policy Tool. You can easily switch back and forth between the two windows by clicking the respective icon located in the top left of your screen. How do I upgrade or renew my subscription of Security Policy Tool? Most information like this can be found in your Customer page. To access this simply login to your account and click “My account”. To reinstall Security Policy Tool you can go to your “My account” page and visit the Download Center. In this area you will be able to get the latest Security Policy Tool version download. To download, install, and activate Security Policy Tool you must have a reliable internet connection. Confirm you are connected to your local network and try again. Being connected to a VPN may cause communication errors between our servers and your computer. The best solution is to disconnect from the VPN, connect to your local network, (download/install) Security Policy Tool, and then log in to activate your account. After you have activated your account you can reconnect to your VPN and use Security Policy Tool without issue. Some users may experience issues Downloading, Installing, or Activating Security Policy Tool as a result of their computer’s security settings. Various Firewall or Anti-Virus Software may cause communication interference between your computer and our servers during the activation process (e.g., logging-in for the first time after successful download/installation) or not allow the required installations (e.g. During your first run of Security Policy Tool you may need to temporarily “Pause” or “Disable” your Firewall or Anti-Virus Software to resolve this issue and successfully Download, Install, and Activate your account. NOTE: Be sure to un-pause your Firewall/Anti-Virus as soon as you have successfully gained access to Security Policy Tool. If you are unable to do this, you may need to speak with the IT Administrator where you are employed to help you resolve this issue. 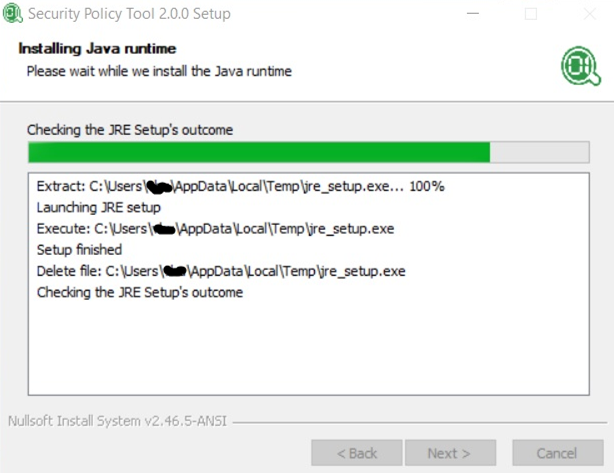 Click here for Java Runtime issue! 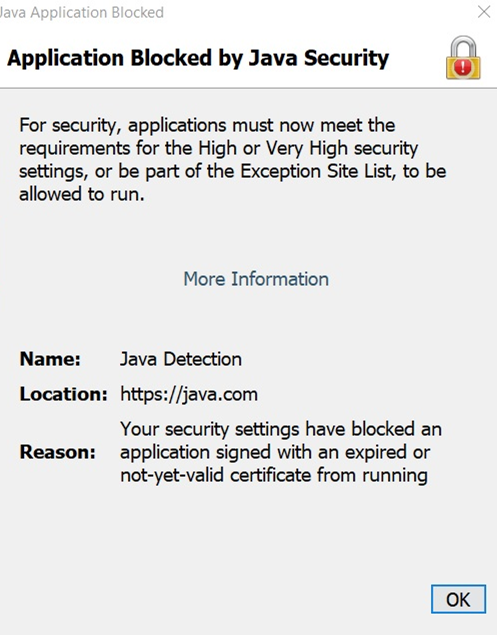 If you encounter a Java applet in your web browser, and see a window display that says Application Blocked by Security Settings during installation of Security Policy Tool as shown below means your security settings have blocked an application from running with an insecure or expired JRE (Java Runtime Environment). It may be due to running an old version of Java on your computer. Click in the empty field under the Location field. Enter the URL (the URL should start with http:// or https://, for example, http://www.domain.com). The domain name of the embedded applet’s codebase URL may differ from the domain name of the web page you are visiting. If so, add both domain names. 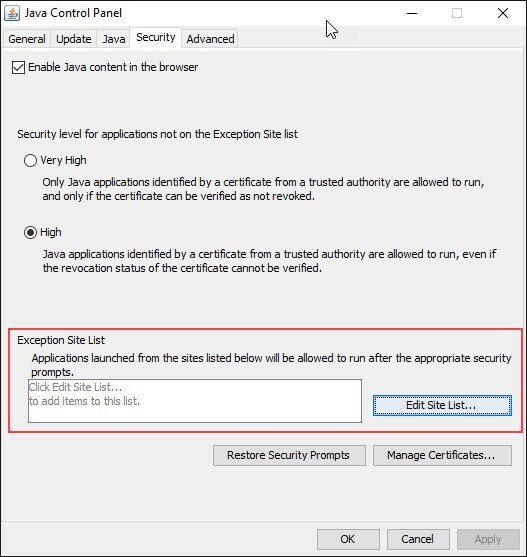 Further information on How can I configure the Exception Site List? Why am I having trouble viewing Security Policy Tool on my screen? Occasionally, depending on the size and resolution of your screen, Security Policy Tool may not be displaying as you would like. Although Security Policy Tool can be used on any sized laptop or monitor we recommend using a size 27” or larger monitor with a resolution of 1920x1080 or greater for the best experience possible. Please note, all Security Policy Tool windows can be resized as needed as well. Sometimes users with High Definition (4K) devices may experience an issue where Security Policy Tool’s font becomes very small. Click here to view the solution to the Windows [HD(4k) Screen] small font issue.